In 2004, a magnitude >9 earthquake struck North Sumatra and the Andaman-Nicobar islands leading to a huge tsunami. In order to find some explanation for this event, Expedition 362 (August- September 2016) drilled sites U1480 (1432 m below the seafloor) and U1481 (1500 m below the seafloor) on a section of the seafloor ~200 km west of Sumatra, before the Indian Plate reaches the Sunda subduction zone. 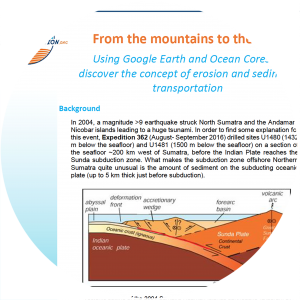 What makes the subduction zone offshore Northern Sumatra quite unusual is the amount of sediment on the subducting oceanic plate (up to 5 km thick just before subduction). Geologists have determined that the sedimentary materials being incorporated into the North Sumatra subduction zone are related to the Bengal-Nicobar Fan system, which originates more than 3000 km away from our drilling site! This fan is the largest submarine fan currently on the planet. This sedimentary system originates from erosion of the Himalayan mountains. Rivers carry the eroded material to the coast. If most of the sediment (~80%) is deposited onshore and offshore quite close to the coastline, a huge amount still makes its way along deep-sea canyons to the deep-sea portion of the Indian and even Australian plate. During Expedition 362, a lot of turbidites coming from the erosion of the Himalaya mountains have been described in the cores. In the cores, they are units starting with sand levels fining up to clay levels and reflect an avalanche style deposit.